Fatality is a simple death report addon which announces information about the last hit(s) a person took before they died. What makes it better than other, similar addons? It's extremely lightweight and consumes much less CPU and memory than other addons. 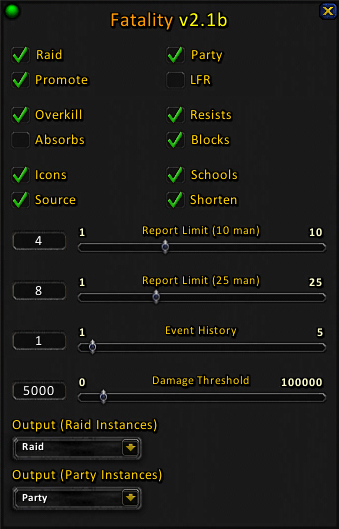 If you're concerned about your FPS and general performance while raiding and want a simple addon to accurately report deaths without any extra junk or bloat, look no further. Can I choose where the informaton is announced? Instance Instance chat - party/raid/instance, depending on your group. Self Just you - no one else will see these announcements. Guild Guild chat - you must be in a guild. Officer Officer chat - you must be an officer in a guild. Party Party chat - you must be in a party with at least one other person. Raid Raid chat - you must be in a raid with at least one other person. Raid Warning Raid warning - you must be promoted to Raid Leader/Raid Assistant. Channel A private channel, e.g. FatalityReports. Whisper A specific player, e.g. Moop. Why can't I see any announcements? By default, announcements will only be sent while inside Raid/Party instances. What information is included in the reports? How are Cauterize and Spirit of Redemption "deaths" handled? • Cauterize does not guarantee death and an announcement is therefore not sent when it procs (unless the Mage actually dies). • Spirit of Redemption does guarantee death and is reported with an asterisk (*) next to the Priest's name as an indication of their current state. How are deaths with known/unknown causes handled? Situation: No damage is recorded within the 2-second timeframe. This usually occurs when either (1) The person running Fatality is in another realm and data cannot be recorded (Ultraxion) or (2) A person falls off a platform and there is no recent damage events that can be linked to their death (Warmaster/Spine/Madness). Situation: Damage is recorded within the 2-second timeframe, but no overkill is reported by the combat log. Situation: Damage is recorded within the 2-second timeframe, but this time the combat log does report an overkill. How do I enable/disable the addon? Click the small green/red button at the top left of the configuration UI or type /fat on|off. How are character-specific settings handled? Configuration settings are saved separately for each character. However, the enabled/disabled status of the addon remains the same for all characters, i.e. if you click the green/red button to turn the addon on/off, it will also affect your other characters' settings. Fatality still announces when there are other people in my group with it installed. Can you do something about this? I'm afraid not; Fatality was designed to be an extremely lightweight solution for death reports. In order to implement a "smart disable" option, it would be necessary to make use of the Blizzard AddOn communication channel which can lead to a negative impact on your game's performance and, since I value my FPS, client-to-client communication is currently not something I want to include in any of my addons. Which locales are supported and how can I help with translations? If you notice any inaccurate or missing translations, visit the localisation page, leave a comment here, or send me a private message and I'll make sure they're corrected.